Maud: I am nasty, too. Jean-Louis (Jean-Louis Trintignant) is a recently converted devout Catholic, who at the beginning of the film, falls in love with a beautiful blonde named Francois (Marie-Christine Barrault) in Church. He follows her, but loses her in traffic. He meets old friend Vidal (Antoine Vitez) by chance in a restaurant and the two talk about their views on philosophy, religion and mathematics. 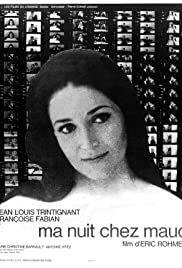 They go to the house of Maud (Francois Fabian), a flirtatious, free-spirited woman who takes an interest in Jean-Louis. When the snow falls heavier outside, Jean-Louis is forced to spend the night at Maud's, putting a strain on his new found beliefs on marriage, commitment and fidelity. Eric Rohmer's film is full of dialogue. The characters talk and talk, often so intellectually that I had trouble keeping up. But the talk is interesting and intriguing. The main theme (it appeared to me, anyway) is the value of faith in a world where the likelihood of heaven is becoming increasingly unlikely. Jean-Louis, a former ladies man, fights his urges when Maud invites him into her bed. He eventually climbs in, feeling the cold, and begins to kiss her. He eventually pulls away, looking almost angry with himself. He obviously feels that an eternity in heaven, however unlikely the idea is, is worth more than a moment of weakness and happiness. The dialogue-heavy scenes may not appeal to everyone, it can at times be difficult to engage with the film and bourgeois characters. But it is richly rewarding and a highly intelligent character study. The film has an almost love/hate attitude to the idea of Christianity in a similar way to many of Bergman's greatest films. One of the most intellectually stimulating films of the French New Wave movement.